Could it be time to make telematics insurance policies available to drivers in much greater numbers? To what extent is there still consumer resistance or lack of awareness? How can we define the inertia, the motor policy systems duplication, or other technology shortcomings that are preventing such products being widely available? From our recent research at LexisNexis Risk Solutions, we discovered that the majority of UK motorists are open to adopting usage-based insurance (UBI) programmes, when the real benefits are explained. The data quality, data availability and the hardware cost have been improving many times over since the early period of telematics and retro-fitted vehicle black boxes. Four our of five young drivers in the UK now benefit from telematics insurance products, roughly one million drivers out of the country’s total 39 million driving licence holders. It’s almost exclusively this age group that has seen the benefits in terms of lower road casualties (down by down by over a third since 2013) achieved through driver coaching and incentives, as well as lower premiums and access to new services. On the road to advanced connected vehicles and semi-autonomous vehicles, with the proliferation of new technology like Advanced Driver Assistance Systems (ADAS) soon to become new rating factors for insurance, there’s a need for the insurance industry to prepare today. Highlights of the research findings are shown in the infographic. 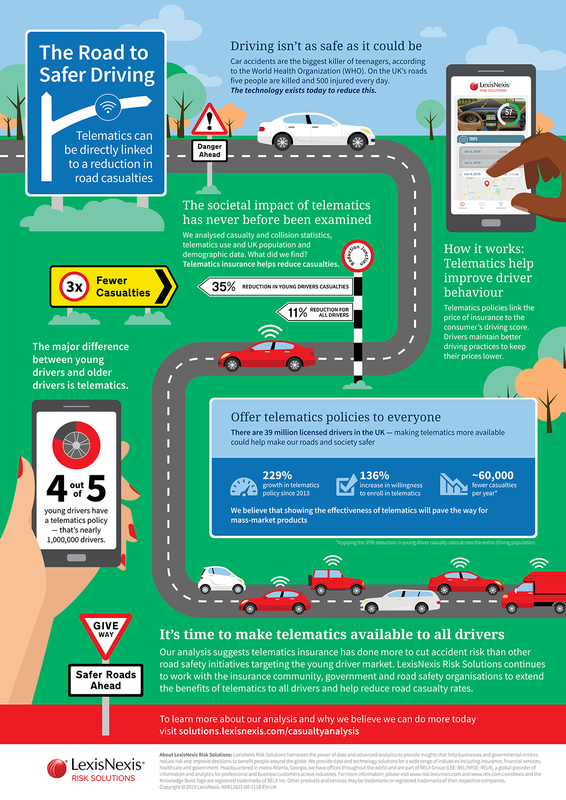 For the full study download the white paper The Social Benefits of Telematics-The Role Telematics Plays in Reducing Road Casualties.